He can’t be kept a secret any longer. He’s smart, nice, liked by all. Why is he targeted for destruction? Daryl (Barret Oliver) is the kind of boy any youngster would love to be like - and any mother would want as her son. 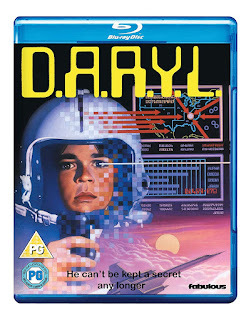 Fabulous Films will be bringing the classic 1985 family sci-fi feature D.A.R.Y.L. to Blu-ray for the first time in the UK. Daryl is a whiz at school, brilliant at computer games and sports- and even tidies his room! To his foster parents, he is the perfect kid- perhaps too perfect. What is Daryl’s secret? Why can’t he remember anything about his past, yet in the present, he goes beyond even genius levels of intelligence. The shocking truth is revealed the day his real parents turn up to claim him and his perfect ordinary life is threatened by adults bent on his destruction. D.A.R.Y.L. arrives on Blu-ray and DVD from Fabulous Films on 22nd April 2019.